Two events in recent days have turned the tables on Chinese initiatives since 2009 in taking control of the vast waters of the South China Sea. On October 27, a U.S. guided missile destroyer passed within 12 miles of the Subi Reef in the Spratly Islands of the South China Sea (SCS) on a Freedom of Navigation Operation (FNO) which China condemned as a threat to its national sovereignty. Two days later the Permanent Court of Arbitration in The Hague rejected China’s argument that the Court had no jurisdiction over the Philippines’ challenge to Chinese territorial claims in SCS. Since 2009, China has effectively been one step ahead of other claimants and the U.S. in getting what it wants through a deliberately confounding mix of rhetoric and actions. While reiterating its commitments to peaceful resolution and joint development, Beijing has demurred at signing on to a Declaration of Conduct and Code of Conduct with ASEAN nations, provoked skirmishes with Philippines and Vietnamese vessels, set up oil rigs in disputed waters, reclaimed land on shallow reefs on an astounding scale, and continually projected an expansive historical claim while abstaining from defining it to meet the legal requirements of international maritime law. The success of these encroachments – often termed the salami-slicing approach – hinges on no one calling the Chinese military presence bluff and taking a counter-stance in disputed waters. In 2012, the Philippines Navy pulled back from a military standoff against Chinese maritime surveillance ships in the Scarborough Shoal, only to have China renege on reciprocal withdrawal and thus gain exclusive control of the shoal. This failed deal was brokered by the U.S. The FNO of the USS Lassen was a change in momentum, but not primarily in the sense of American brinkmanship thwarting Chinese advances. There is no indication that coercion will be applied to roll back de facto Chinese control over features and maritime areas, or to compel Beijing to make concessions on historical claims, or to bring in a U.S. military show of force of the scale seen during the Taiwan Strait Crises of 1955, 1958, and 1996. In fact, in the short-run, the inevitable diplomatic vitriol and militarization by China may seem counterproductive to the aim of peacefully resolving disputes. China would surely augment its infrastructure and military capability over specific islands and ocean zones. 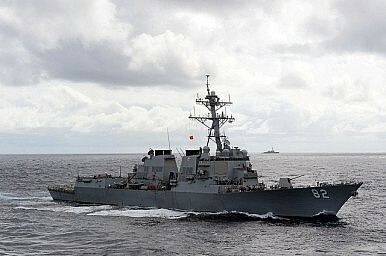 However, we believe the U.S. warship in disputed water makes a strong political statement on the future Sino-American relations and sends a clear operational signal to U.S. allies in the region. The gunboat diplomacy tests Beijing’s resolve in keeping its word following an affront to its national face. Would China adhere to its professed principle of peaceful resolution of conflicts? Would it revoke its reassurance at the last ASEAN Summit that land reclamation projects were completed and in any case do not affect freedom of navigation by air and sea? The U.S. underscores freedom of navigation as the actionable principle guiding U.S. military responses to Chinese maritime expansionism in SCS. The freedom of navigation is not an ideal state, but a status quo that is readily reinforced by the presence of U.S. warships with acceptable risks, and repeated as necessary. While demonstrating American naval hegemony in the region, this mission strictly speaking neither forces the U.S. to take sides in sovereignty and territorial disputes in the SCS, nor poses concrete security threats to the Chinese. It does create room for maneuver for U.S. security allies and Vietnam to expand naval or coast guard activities over the disputed water on the proven basis of American clarity of intention and level of control in the use of force. It also strips China of any pretense that it is a defender of UNCLOS, limiting it to criticize the regime’s definition of “innocent passage” at the same time as denying its authority over Chinese maritime claims under the Nine-Dashed Lines. Nonetheless, U.S. President Barack Obama is incurring a very real risk of armed escalation, which suggests that in Washington’s interpretation of Chinese elite politics there is no domestic division in China to exploit over this issue. There is no pacifist camp in China whose bargaining position might be harmed. Having centralized decision-making and information flows on this issue, President Xi Jinping is effectively making the call. Moreover, political statements on both sides are predicated on an implicit understanding that an escalation from the use of or threat of limited naval deployment into an act of war is strictly against the national interests of both parties. In fact, there might be opportunities to enhance military ties. The USNS Impeccable incident in 2009 and the near collision between U.S. Navy P-8 surveillance plane and a Chinese fighter in August 2014 have prompted improved military-to-military cooperation between the two powers, leading to the Chinese Navy participating in U.S.-led naval drills off Hawaii in July 2014 and Xi announcing bilateral “confidence-building” measures last November. Policymakers in Washington may have learned a lesson from the Russia annexation of Crimea, which exposed Europeans in badly miscalculating Putin’s willingness to defend Russia’s sphere of influence. The U.S. is not willing to give away its leadership in the Asia-Pacific and Xi hasn’t much space to maneuver, in either international law or regional security alliances. However, “American adventurism” – to borrow Mao Zedong’s propaganda terminology – is being conducted today within a very different geopolitical context. The last time Americans militarily defended another country’s territorial integrity against its neighbor was on behalf of Kuwait against Saddam Hussain in 1991. The last time the U.S. Navy engaged in a major naval battle was seventy years ago in the Pacific Theater against the Japanese Imperial Navy. The USS Lassen is not an agent of change in the direction of armed conflict. Both sides would do well to proceed to address the practical consequences of this political message. It is a new reality, but it need not be a harbinger of the worst-case scenario. Kun-Chin Lin is an Associate Fellow of the Chatham House Asia Programme. Andrés Villar Gertner is with the Centre for Rising Powers, University of Cambridge. The FONOP is the first to take place since a July ruling on China's claims in the South China Sea.